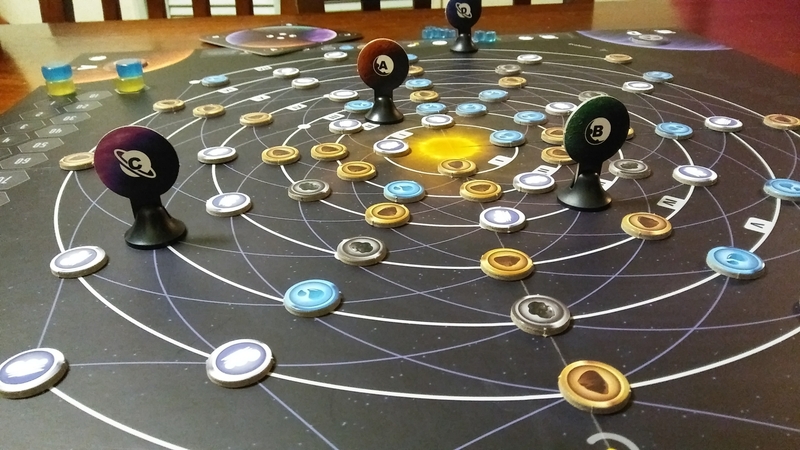 In Planetarium, players take the role of creators by moving matter and planets around a newly formed sun in order to create a new and prosperous solar system. This is a set collection game at it’s heart but focuses on planning ahead and hoping others don’t screw up your plans too much. Let’s find out how to be the master of the universe in Planetarium. The board is made up of 7 orbits around a newly formed star. Each orbit has white dots on it that will hold matter floating around in space. Start the game by randomly placing matter tokens on all the white dots and the planets on the corresponding spots. Put the habitable/hostile token on each corresponding planet spot. Each player will choose a color of their choice and take all the cubes associated with that color. Place your point trackers on the points track. Each player takes a planet player board. The last thing the players will get is 2 Low Evolution cards, 2 High Evolution cards and 2 Final Evolution cards but will only keep one final evolution having to discard the other. We are now ready to play. Each player will take a turn until the end game trigger happens. When that triggers, each player will get one final turn. 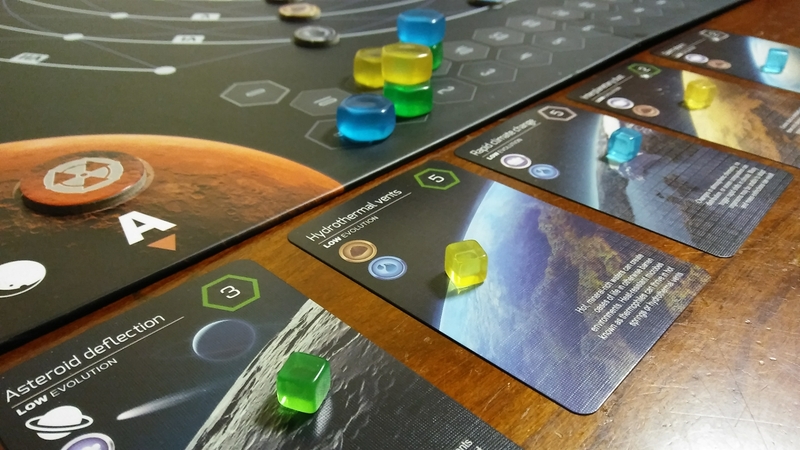 On a player’s turn they will simply move a matter token or planet and play a card….if they can. During the movement phase, each matter token and planet can only move one spot, until the acceleration space is covered then they can move two spaces. Your goal is to connect matter to planets. 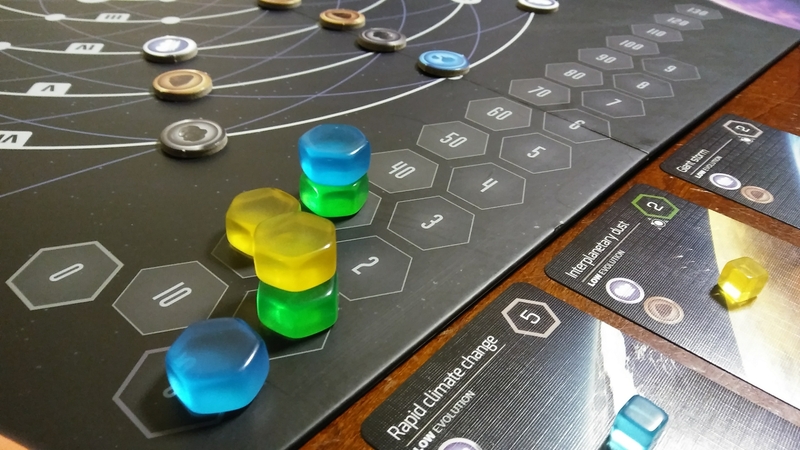 Once you connect a piece of matter to a planet you take that matter token and place it on your planet player board in the spot of that planet. Every time you collect a matter token for that planet they will go on that planet. After the movement phase you can then play a card if you satisfy the requirements on the card. The requirements will be mainly associated with matter icons, but you might also see planet type and orbit restrictions. 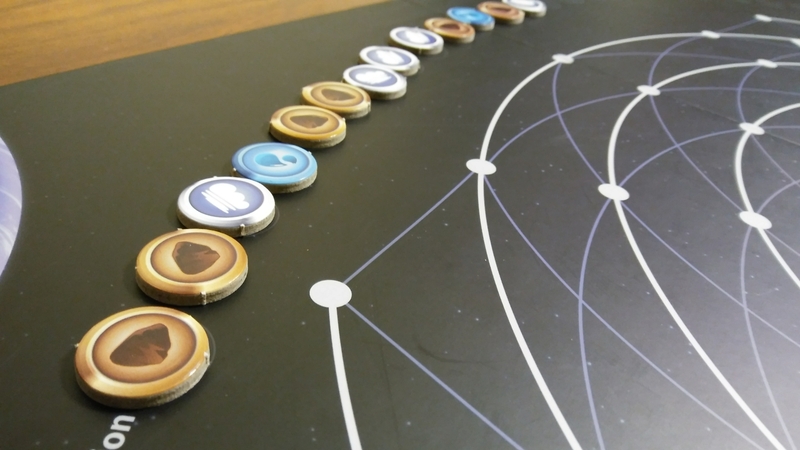 Once you play the card you put it on the side of the board that represents that planet and put the matter tokens you used on the evolution track, which is the timer for the game. The player then puts one of his cubes on the card that he played and scores points indicated on the card. They then check if the planet becomes habitable or hostile and turns the planet token to the appropriate side. If a player plays a card during their turn, then they draw a new card. You can get a new Low or High Evolution card or draw two Final Evolution cards but only get to keep one. Final Evolution cards are only useful for the very end of the game. 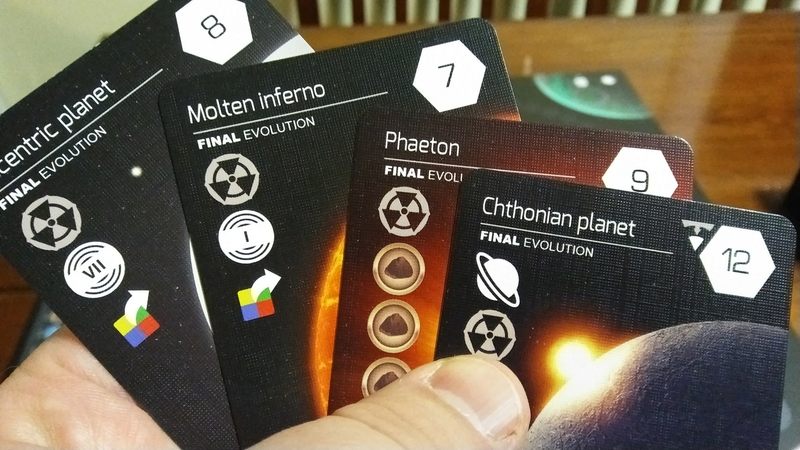 Once the evolution track is completely filled with matter tokens, the game will end. This is the only time you can play Final Evolution cards. They are played exactly like other Evolution cards but this time, you have to place them on a planet that you have already evolved during the game. You need to play as many Final Evolution cards as possible because you only get one chance. The player who completed the evolution track will begin the final round, once all players have had a chance to play Final Evolution cards, the game will end. The player with the most points at the end of the game, was the most influential person in creating the new solar system and is the winner! 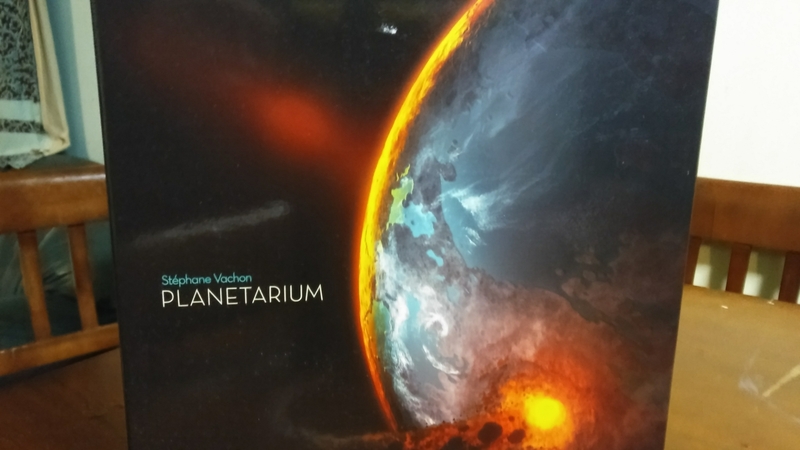 The components in Planetarium are really good. By far the best thing about this game is the art and iconography! The art is just beautiful, and really sets the mood for being a space themed game. Each card seems to have its own art which is always a bonus. The iconography is big and easy to see. After one round of play, there is really no need to ask what an icon means as players will easily learn their meanings. The player pieces are good plastic pieces and the scoring markers look great. The cardboard tokens are some of the thickest I have seen in a game. The only issue that I have is with the scoring track…..it is not very easy to make sure you have or get the right points and can be confusing. The good thing is you can just keep track by adding all your cards out on the board. I wish it would have been a track similar to the evolution track…..maybe switch the two. Overall, I am very happy with the way this game looks and feels. There is nothing to this game that is mind blowing or out of this world good…..but it flows extremely well. The set up time is super quick. You can teach the game in less than 5 minutes. Turns are simple and quick, making downtime very minimal. It is a set collection game that forces you to make good decisions. Choosing what planet you want to work on and what you need on that planet to get the Evolution card down is really good. There is also a nice decision about when to go for more Final Evolution cards. You still need to score points but getting specific Final Evolutions that will help you or give you time to get them set up is key. That all depends on if someone else leaves your planet alone. The other mechanism that is really nice is the part where you can’t play a Final Evolution on a planet unless you have evolved that planet during the game. It makes planning and strategy more important. Again, there is nothing great in this game but it all works really well. I am on the fence about the replayability. Yes, the tokens will be completely different every time. Yes, you will have different cards every time. Yes, different players will play different ways. That being said, you are really just doing the same thing every time…..set collection and playing cards. The planets all start in the same place but even if that was varied it would still have the same feel to it. I don’t think the game is unplayable after the first couple of games but also don’t think it is unique enough to make it to the table often. The theme helps the most, but not enough to carry it and erase my concerns. This is my biggest issue with the game. There is a lot of randomness and luck involved. There are very few things that you have actual control over. Since everyone can move any planet and play any card on a planet changing where it is and what type of planet it is, the Final Evolution cards just seem to be pure luck. You just hope you have a planet that you can use for any of your Final Evolution cards. It just seems the best strategy is to get as many Low and High Evolution cards out as possible and see where that leads you. I backed this game on Kickstarter hoping it would be a nice introductory game into the board game hobby. I think it fills that niche pretty well. Will it be a game that we play multiple times over a long period of time? No, probably not. But it will be a game that we will be able to get out and play every so often. Since it is easy to teach and learn, many people will be able to play this with out any issues. There is some strategy to the gameplay but not a lot. If you know that going into the game, it would be fine. There are those moments where someone will either take a matter token or move a planet that totally throws your plans out the window, especially later in the game. That may turn some people off to the game as a whole, but for the most part it is not that big of a deal knowing the type of game that it is. If you like set collection and some light strategy, this will be a game for you.